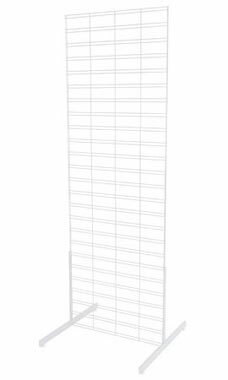 Your customers will love seeing your merchandise displayed beautifully on these Standing Slat Grid Screens! They are featured in a stunning white finish that provides a fresh and clean look that will fit in any setting. Grid Screens are easy and simple to use, and are strong and durable, which make them a great investment. This unit includes one 2'W x 6'H grid panel and 1 set of grid legs. Assembly is quick and hassle free. Choose from our wide range of brackets, shelves, peg hooks, Faceouts, displays, and other accessories that are also available for purchase on our website. All items are backed by our 110% Low Price Guarantee and are in stock and ready to be shipped immediately. I couldn't believe the low price on these slat grid stands, but the quality is there too!